Goyang Orions upset KCC Egis to even the series at 1-1. It looked good early as KCC Egis took a 4-point small lead at the end of first quarter. But then Goyang Orions had a 24-18 second period charge getting the lead and KCC Egis were not able to take back game control losing it eventually 86-97. Goyang Orions players were unselfish on offense dishing 22 assists. American power forward Darryl Monroe (201-86, college: George Mason) orchestrated the victory with a double-double by scoring 18 points, 12 rebounds and 8 assists. 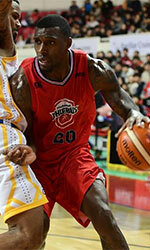 International center Seung-Hyun Lee (201-92) contributed with 19 points and 6 rebounds for the winners. Goyang Orions' coach Il-Seung Choo allowed to play the deep bench players saving starting five for next games. American Brandon Brown (201-85, college: CS San Bernar.) replied with 31 points and 8 rebounds and the former international center Seung-Jin Ha (221-85) added 9 points and 14 rebounds in the effort for KCC Egis. Five Goyang Orions and four KCC Egis players scored in double figures. LG Sakers rolled past KT Sonicboom to open 2-0 advantage. The hosts trailed by 9 points after first quarter, but they rallied back and won the game by 4 points. LG Sakers looked well-organized offensively handing out 21 assists. The best player for the winners was international center Jong-Kyu Kim (207-91) who had a double-double by scoring 29 points, 12 rebounds and 4 assists (on 12-of-14 shooting from the field). Central African-American power forward James Mays (205-86, college: Clemson) chipped in a double-double by scoring 27 points and 13 rebounds. LG Sakers' coach Young-Min Kim used a ten-player rotation in such tough game. 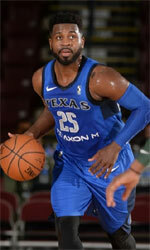 American point guard Justin Dentmon (183-85, college: Washington) produced 19 points and the former international forward Hongseok Yang (199-97) added 10 points and 10 rebounds respectively for the guests. Four LG Sakers and five KT Sonicboom players scored in double figures.